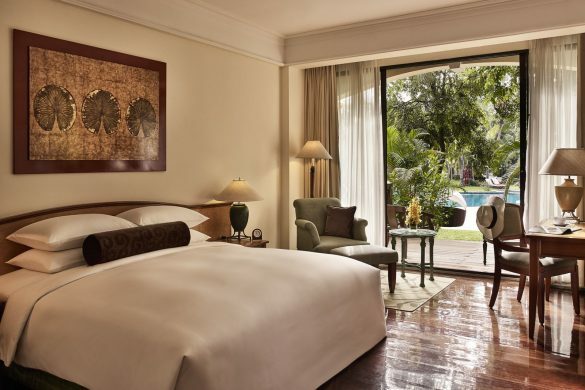 Sofitel is the best hotel in Siem Reap, with a standard of accommodation that has seen the hotel regularly awarded as Siem Reap’s best angkor golf resort. Luxury distinguishes all the room categories of our Angkor Spa Resort, ensuring that if you are travelling independently, as a couple, family, or business visitor, you will live in absolute comfort with the most modern of conveniences, with the most gracious service to make your stay a memorable one. There are 238 rooms, including 23 suites and the premier Opera Suite. Décor of each of the rooms evoke the elegance of the colonial era, with Khmer influences to reflect the great cultural heritage of Angkor Wat. Free Wi-Fi is available in every room, flat-screen television, minibar, safety deposit box, and the spacious bathrooms include luxurious toiletries. 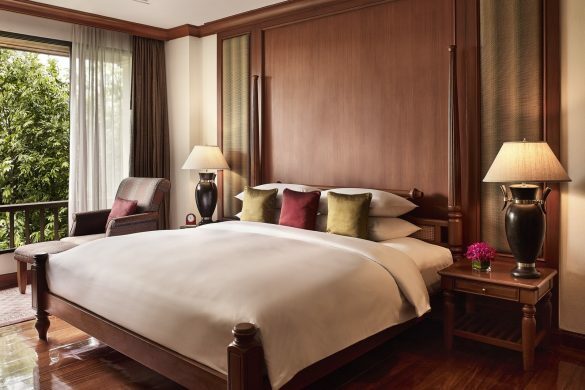 Our own-brand Sofitel MyBed in each room assures you of a blissful night’s sleep. This is the assurance of booking the best hotel in Siem Reap. Our Angkor spa resort offers you the kind of accommodation that will suit both your needs and your budget. Our Superior Room provides a generous 36sqm of space and is elegantly designed with beautiful wooden floors, ceiling fan, and a spacious bathroom with separate bathtub and shower. King, twin or triple MyBed options are available. Lanvin amenities are supplied to all rooms in this category. Stay in one of our Luxury Room, and the fresh greenery of the resort’s landscaped gardens will lie just outside your window, to be enjoyed from the privacy of your own balcony. This room category features 46sqm of space and comes with king or twin bed options. Inside your inviting bathroom are separate bathtub and shower, and luxurious L’Occitane amenities. A Family Suite is ideal for those travelling with youngsters, as the rooms offer extra space for living and sleeping. For couples celebrating a special getaway, our suites are perfect to kick back and relax. The Junior Suite has 70sqm of space with a living room, walk-in closet, luxurious bedroom, and private terrace or balcony. A king-size MyBed is standard, there is an espresso coffee machine, and the large bathroom has separate shower and bathtub, with luxurious amenities by L’Occitane. Our Prestige Suite is even larger, at 90sqm. Here you can unwind in your own living room, looking out to the lush green garden, or enjoy the breeze from your own private balcony. The Prestige Suite features our king-sized MyBed, espresso machine, guest bathroom and spacious bathroom with a television, and beautiful Hermes amenities. When staying at one of the best hotel in Siem Reap, the epitome of luxury accommodation is entirely suitable. That means our Opera Suite. At 140sqm, the space here is large enough to accommodate a family, and the living areas are also suitable for entertaining, making this gorgeous suite perfect for both leisure and business travellers. Encompassed in this enormous space are the living room, dining area with kitchen, and separate king and twin bedrooms. Flat-screen televisions, an MP3 docking station, and an espresso coffee machine are all included. The exquisite bathroom features a Jacuzzi and comes with Hermes amenities. Personal butler service is included with the Opera Suite, to ensure that your every need is met.